Arriving at Catalina’s house, I had no idea what to expect. I knew the elders that Nija’nu worked with were living in poverty but poverty can take so many forms. 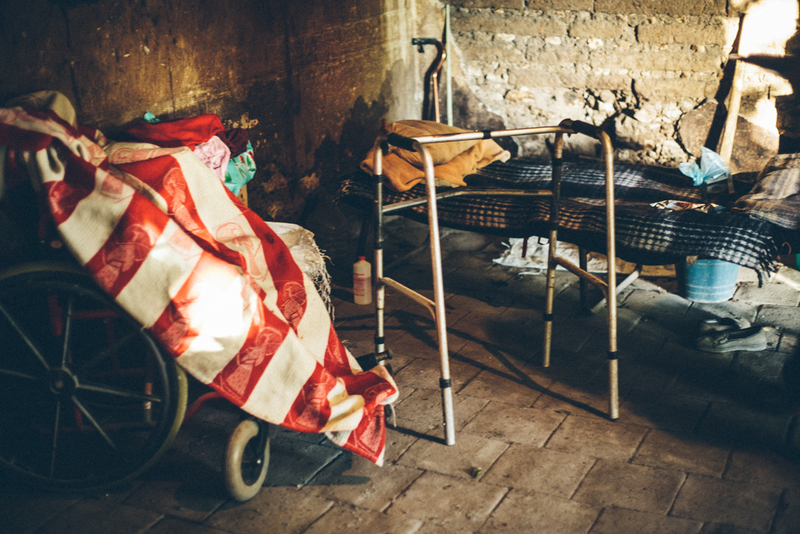 Walking down the path to Catalina’s front door, I began to see what poverty meant to her. 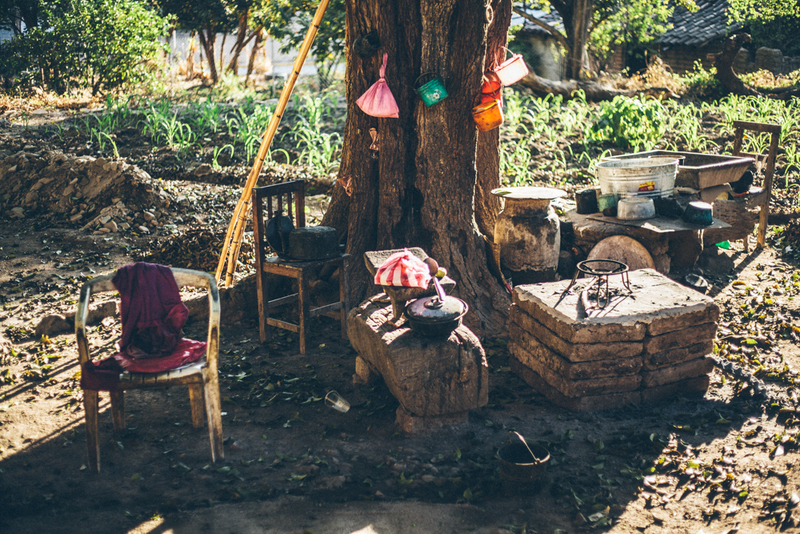 Poverty meant that her ‘kitchen’ was outside under a tree, a few pots and pans over a makeshift wood stove, a sink fashioned from a metal bucket. No water, no gas, no electricity. Catalina appeared at her door and a big smile spread across her face as she limped slowly to greet us. It turns out she had fallen a few days earlier and was feeling sore and bruised, but she was clearly elated to have visitors. 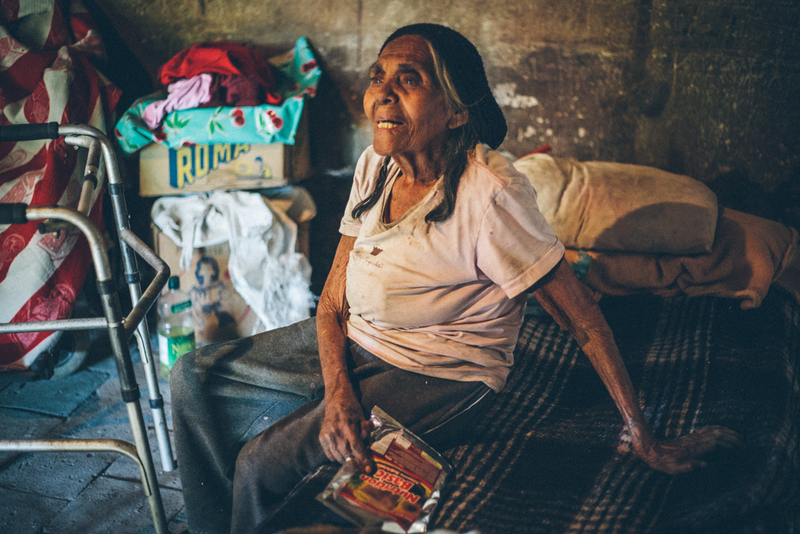 We met her halfway and entered her house, where Catalina’s poverty took another form. 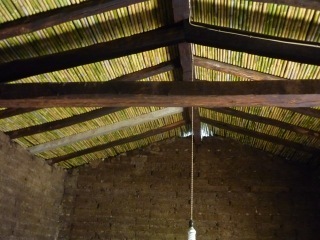 The ceiling of her house was made from wood beams, and reed covered with clay tiles. It was teaming with cobwebs and had large gaps that opened to the sky and clearly let the rain in during the wet season. It had certainly not been repaired for decades. There were no windows or light and she slept on the metal frame of a camping bed with no mattress to cushion it. Catalina was aching from her fall and I imagined how sleeping would give her no comfort at all. I looked around and realised there was no bathroom. Catalina had to go outside behind the bushes, risking a fall every time and facing the elements. Her hands were crippled by arthritis and she was hard of hearing (the Nija’nu team later informed me that this was due to an ear infection that never healed for lack of money for medicine). This was Catalina’s poverty, yet her smile remained along with her sweet vibrancy. We sat and we talked. She told me about her past, about meeting her husband and about the intense connection they had because they were both orphans. He had recently returned from working as a Bracero in the US when they met and they married quickly and were extremely happy. A lonely tear came to her eye when she talked of his passing, her son’s drinking and her fear of his violence. When I asked her how old she was she couldn’t say, but she could remember the date and time of the birth of the son who she told me now beats her when drunk. She talked and talked, enjoying having a keen listener and she reached out to stroke my face as if craving physical touch. Catalina left a lasting impression on me. She is a survivor, a woman whose poverty made her rise to the challenge and be stronger. Where I would surely collapse in her circumstances, Catalina endures. Nija’nu has made such a difference to Catalina’s life. They rebuilt her roof, and divided her space into two. 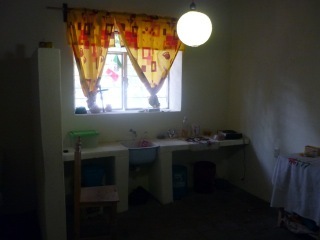 They created a safe and dry living space with a small kitchen area, a sink and a flush toilet. She now has a door she can lock, lights she can turn on, and a window to look out of. Her camping bed now also has a decent mattress with cozy sheets and blankets., she has dishes, pots and pans and even a small TV. In addition to the work Nija’nu did on Catalina’s house, they also pay her electricity bill and she receives a monthly food package. Catalina enjoying a hand massage from volunteer Ephemera Wilde. The team also made some interventions in relation to Catalina’s son, but his issues are complex and ongoing and her personal situation remains as something that she must endure. However, knowing that there are people she can turn to and who care about her wellbeing has made that endurance just that tiny bit easier. If Nija’nu can do this for Catalina, just imagine the difference they are making to the 30 elders who they work with, let alone the community of Santo Domingo Tonalá as a whole. They are currently fundraising to be able to continue their work in the coming year. They have raised half of the $10,000 USD they need and have launched a crowd funding campaign to raise the rest. It blows my mind that they can do sooo much with so little. Please take a look and donate if you can and please spread the word. The more people who are aware of the good work of Nija’nu the better. Sincerest thanks for reading this far! 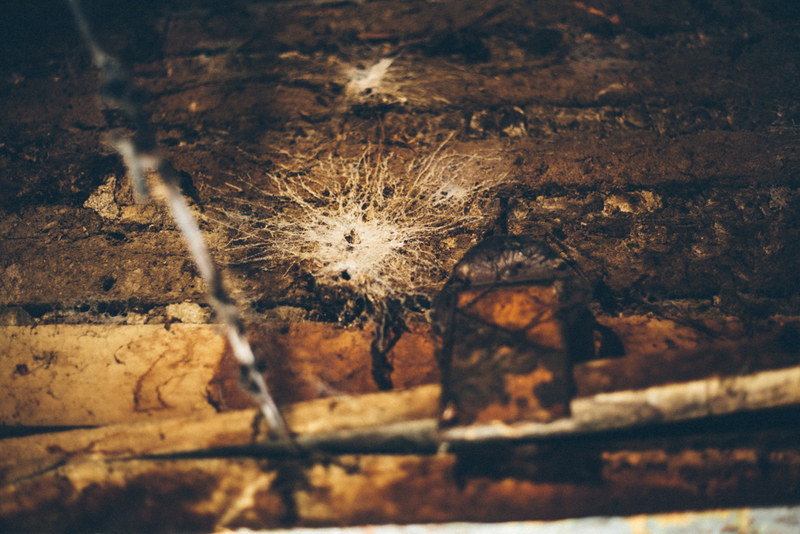 Photos of Catalina and her home before the renovation courtesy of Nikhol Esteras Photography. Sharing the back story about Mexico and her people is important. As tourists we tend to focus on the commercial beauty polished up and made pretty just for us. Behind the scenes are dozens of stories like this one and individuals who can benefit from support. Help where you can! Please could you send me a link to where it is re-blogged, when you get a moment, so i can share it with the person leading the campaign. Many thanks again.